The G-7 continues to express concern about the East and South China Seas and the Korean Peninsula. Over the weekend, the foreign ministers of the Group of Seven (G-7) gathered in Saint Malo, France, for their annual meeting and released a wide-ranging communique addressing, among other issues, maritime security in the Asia-Pacific and North Korea’s disarmament. “We reiterate our commitment to promoting cooperative, international oceans and seas governance and to maintaining a rules-based maritime order based on international law,” the extended joint communiqué released by the ministers noted. “In this context, we stress the importance of maintaining a free and open Indo-Pacific region based on the rule of law through promoting a wide range of activities to advance towards that goal, and express our intention to work together with ASEAN and other countries in this endeavor,” it added. The statement marked the third year in a row the G-7 foreign ministers had referenced the Indo-Pacific, a concept favored by the United States and Japan to refer to the region extending from the western coast of India to the west coast of the United States. 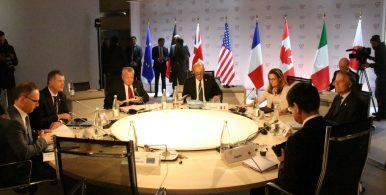 As in previous years, the G-7 ministers noted their concern about disputes in the East and South China Seas — a particular concern for Japan and the United States, and increasingly France and the United Kingdom. “We emphasize the importance of ongoing negotiations for an effective code of conduct and welcome an agreement that does not derogate from the rights parties enjoy under international law or affect the rights of third parties,” the communiqué noted. “We reaffirm that we will never accept a nuclear-armed DPRK and remain committed to the goal of achieving complete, verifiable and irreversible dismantlement of the DPRK’s WMDs,” the statement noted, using North Korea’s official name, the Democratic People’s Republic of Korea (DPRK). The ministerial statement’s expansive view of North Korea’s WMDs resembled the official position of the Japanese government and the position that the Trump administration reportedly had presented to the North Korean leader in Hanoi. “We wish to cooperate with China to resolve the challenges to regional and global peace and prosperity, notably on the Korean Peninsula,” the ministers added. European Union High Representative for Foreign Affairs and Security Policy Federica Mogherini, German Foreign Minister Heiko Maas, Britain’s Foreign Secretary Jeremy Hunt, U.S. Deputy Secretary of State John Sullivan, French Foreign Minister Jean-Yves Le Drian, Canada’s Foreign Minister Chrystia Freeland, Italy’s Foreign Minister Enzo Moavero Milanesi, and Japan’s Foreign Minister Taro Kono represented the seven advanced industrial nations comprising the G-7. The Risks of Kim's Diplomatic Double GameA West in Crisis, an East Rising? Comparing the G7 and the SCOWhat Makes America the Most Powerful State in Asia?What North Korea Means – and Doesn’t – for Nuclear DeterrenceCan China Curb North Korea's Nuclear Ambitions?